Developer-only test units of Windows Phone 7 are already out since last month. 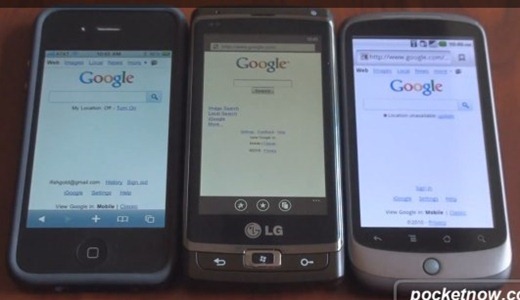 Previously we saw how Windows Phone 7 web browsing stacks up against iPhone 3GS running iOS 4. This time, Pocketnow brings an exclusive look at the web browsing experience with Internet Explorer on WP7, and compares it with Safari on iPhone 4 running iOS 4.x, and Nexus One running Android 2.2 Froyo. Web browsing comparison can be seen in the video attached below. If you have ever used Pocket IE on Windows Mobile 6.x, you will know how painful it was. Internet Explorer on Windows Phone 7 has surely come a long way, and considering that this is still a test version of OS running on a prototype hardware, it does a pretty good job against both iOS and Android. I am personally really looking forward to first of Windows Phone 7 devices when they hit the shelves in a month or two time. What about you? Check out our Windows Phone 7 Activity Center for all things WP7. The overall Windows experience is like 10 times better than the others when you actually browse (it seems like) things like scrolling and zooming in seemed so much smoother. Actually, if you EVER used ANY version of IE, you will know how painful is still IS. Forget the OS thogh… The Nexus is a all round and polished, the iPhone is sleek and thin and shiny, but that LG looks like a 1990s Nokia. Really! And the screen is small and dark. Is that maximum brightness? Shouldn’t they be taking ALL cases and bumpers off for tests like this though? And keeping them at least an inch apart? Who did this test anyway? iPhone is still better by look at this video. Windows Phone 7 is fairly good but it come with IE and it is more vulnerable to virus and iPhone will not. That was a waste of a few minutes. I would never own one of these phones. Iphone 4 please…. Remember, the phone is just a prototype! Will Windows Phone 6.5 users be able to upgrade to Windows Phone 7? The latest jailbreak don’t cause the iphone to get infected. The latest jailbreak exploits a security flaw in iphone’s safari web browser that allows for unrestricted remote access IF the user hosting a malicious PDF file. Remote access is not same as virus infection. Beside, this threat is not applicable until you jailbreak your phone, which is already been patched in a record time.